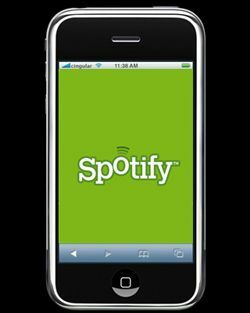 Spotify offers iPod, iPhone and Android syncing for all users | What Hi-Fi? Big news for Spotify fans today – the music streaming service has developed a new version that allows all users, including those on the ad-supported free service, to synchronise tracks they own over wi-fi from their computers to mobile devices. The company says the synchronisation feature has been the top most requested feature from its users. Premium users can already synchronise content from Spotify playlists on iPod touches, iPhones and Android phones, but free users were limited to the desktop version. "You’ve been telling us how much you love discovering, sharing and talking about music in Spotify – and you’ve created well over 200 million playlists to prove it. "But you’ve also said you’re listening to a huge amount of music on your iPods/iPhones, and that getting your Spotify playlists onto them as MP3s has been a serious hassle, forcing you to juggle multiple music players," says Spotify. Now all users can manage any iPod Classic, iPod nano and iPod Shuffle in Spotify. Connect your portable to your computer via USB and it will appear in the new 'Devices' section of your Spotify sidebar. You can then sync all your Spotify playlists to your portable. What's more, Spotify Mobile is now available to Spotify Free users with iPhone, iPod Touch or Android devices, allowing wireless syncing of music from computer to phone – provided it's music you own. To that end, Spotify is also introducing its own music store allowing users to buy 'bundles' of MP3 tracks from its catalogue, in which buying a bigger bundle effectively gives a discount on the songs. Thus a 'bundle' of ten tracks costs £7.99, effectively costing 80p each, while a bundle of 100 costs £50, reducing the price of each track to 50p. • In a separate development, Amazon has cut the prices of MP3 downloads in the US, reducing them to 69 cents, compared to the $1.29 that some songs in Apple's iTunes Store sell at. Amazon has about 10% of the music download market in the US but is now looking to expand.